R-L: OTUNBA SEGUN RUNWESE, DIRECTOR-GENERAL, NATIONAL COUNCIL FOR ARTS AND CULTURE AND PAULETTE M.ADJOVI YEKPE, REPUBLIC OF BENIN AMBASSADOR TO NIGERIA DURING THE 57TH INDEPENDENCE CELEBRATION RECENTLY. 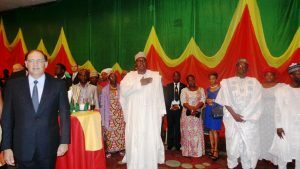 The honourable Minister of Culture and Information, Alhaji Lai Mohammed has facilitated with the Republic of Benin at a dinner recently organized in Abuja to commemorate the 57thindependence anniversary of the country. 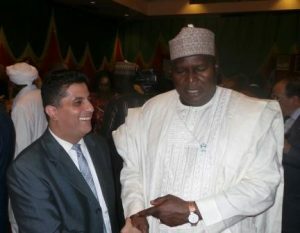 The honorable minister who was represented by the Director- General, National Council for Arts and Culture, Otunba Segun Runsewe, enjoined Benin Republic and her host, Nigeria to sustain the long time standing relationship between the two countries. 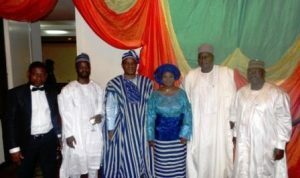 Speaking briefly during the dinner, Runsewe said, “in terms of culture, tourism, sports, trade, commerce and social-political activities, we have a lot in common with the republic of Benin” adding that even the date of independence of both countries was similar. “Nigeria gained her independence on October 1st while that of Benin was on August 1st so you can see the similarity already”. 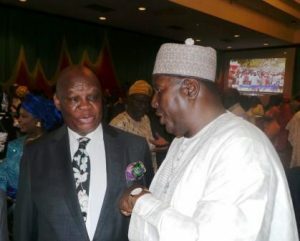 R-L: OTUNBA SEGUN RUNWESE, DIRECTOR-GENERAL,NATIONAL COUNCIL FOR ARTS AND CULTURE AND LULU LOUIS MNGUNI HIGH COMMISSIONER OF SOUTH AFRICAN TO NIGERIA DURING THE 57TH INDEPENDENCE OF REPUBLIC OF BENIN HELD IN ABUJA. Runsewe who was impressed with the way the Beninese in Nigeria have taken Nigeria to be their homes said he was happy that Nigerians being a happy and hospitable people have equally taken the Beninese as their brothers in return. The culture helmsman used the opportunity to charge the Beninese in Nigeria to encourage their brothers and sisters to come to Nigeria and explore the unique opportunities in the country waiting to be tapped. 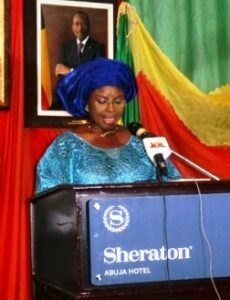 PAULETTE M.ADJOVI YEKPE, AMBASSADOR REPUBLIC OF BENIN TO NIGERIA READING HER WELCOME SPEECH DURING THE 57TH INDEPENDENCE CELEBRATION. 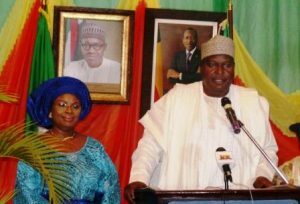 In her welcome address, the Benin Ambassador to Nigeria, Paulette.M Adjovi Yekpe thanked President Mohammadu Buhari for the pleasant reception accorded her while she was posted to Nigeria for the National assignment. The excited Ambassador also appreciated acting President, Professor Yemi Osinbajo for working closely with her country especially in the areas of trade and investment assuring Nigerians that she will continuously work harmoniously with the government of the day by way of collaboration towards enhancing the existing cordial relationship between the two countries. Speaking further, she intimated that, “Development and prosperity can only be achieved in a peaceful environment through regional co-operation”. 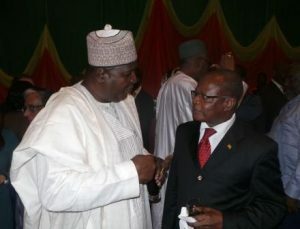 L-R: OTUNBA SEGUN RUNWESE, DIRECTOR-GENERAL, NATIONAL COUNCIL FOR ARTS AND CULTURE AND AMBASSADOR DIMBAN, TOGO AMBASSADOR TO NIGERIA DURING THE 57THINDEPENDENCE OF REPUBLIC OF BENIN CELEBRATED RECENTLY. The event had in attendance, South African High Commissioner, Lulu Louis Mnguni, Togo ambassador,Dimban and many other eminent personalities.